Along the Front Range, even though we’re in the mountains, the summers can get hot and uncomfortable. When even the nights are becoming too hot to go without the AC on, you want to know that the air conditioner is reliable enough to be able to cool down your home. 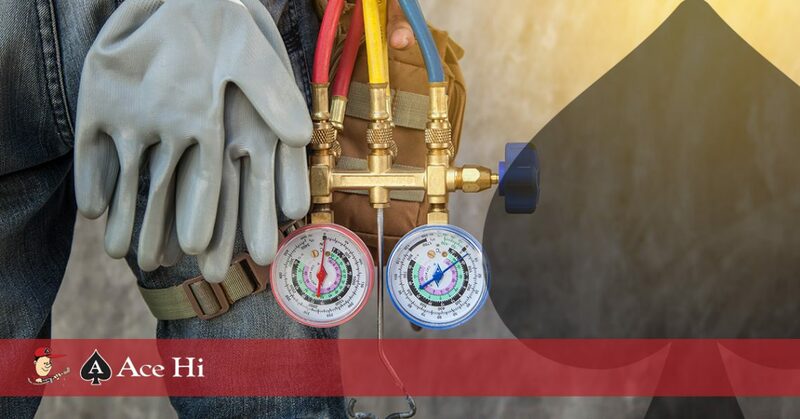 If you have found that your air conditioner isn’t working efficiently, or at all, the AC technicians at Ace Hi Plumbing, Heating & Air will be there to quickly and affordably fix the problem. Our staff is regularly trained to keep up with all of the newest models and we have a proven track record of providing superior customer service. If you’re in need of air conditioning repair, you can count on us to have the knowledge and tools you need for a professional fix. The thermostat isn’t set low enough. The filter may need to be changed. Debris, like leaves, could be blocking the unit. If you hear a screeching or squealing sound coming from the blower, there could be an issue with a belt. If there is a clanging or rattling, this is a sign that there’s an issue with the motor or blower assembly. If this is the case, turn off the unit and call for air conditioning repair. With a clicking sound, there may be an issue with the relay system, or failing or loose hardware. The condensate line could be clogged. Refrigerant may be leaking from the drain line. There could be an airflow issue due to a dirty filter or blocked ductwork. When the weather gets too hot, it’s great having a cool home where you can retreat to. But when the AC system isn’t working, you need a HVAC company you can rely on. Ace Hi Plumbing has been providing Fort Collins, Loveland, and Estes Park with high-quality air conditioning repair, maintenance, and installation since 1996. If you’re ever in need of AC repair, get in touch with our experienced and professional team.